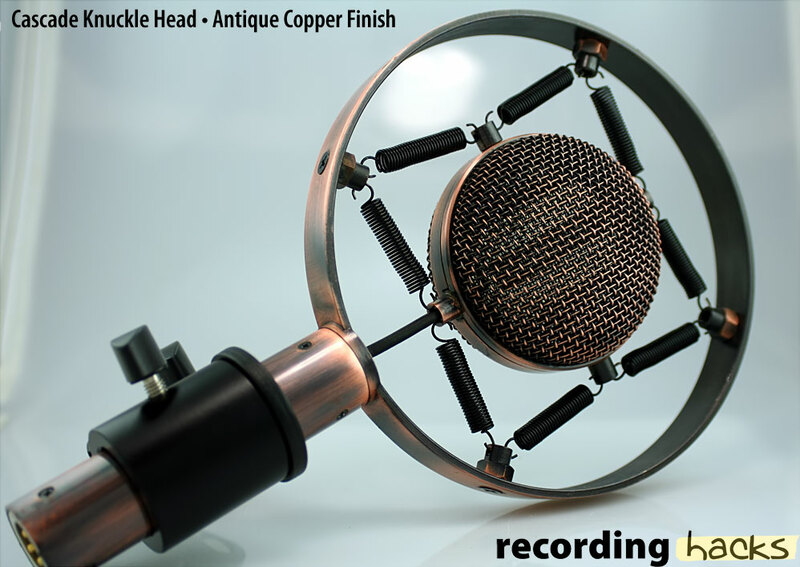 The Knuckle Head is a passive ribbon microphone that combines the acoustic components of the successful Fat Head ribbon with a shockmounted headbasket design reminiscent of early broadcast microphones. The ribbon motor uses Neodymium magnets surrounding a 2.2-micron corrugated aluminum ribbon measuring 5mm x 45mm. 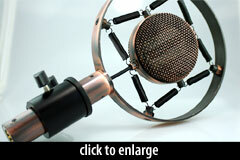 The ribbon is mounted symmetrically within the magnetic gap, making the Knuckle Head suitable as the “mid” mic in a MS setup — the front and back of the mic should produce the same sound. According to Cascade, the Knuckle Head ribbon, at 2.2 microns, is slightly thinner than the Fat Head ribbon (2.5 microns), and although otherwise the same in size and corrugation, creates a slightly brighter sound with less of a bump at 400Hz than the Fat Head. The ribbon motor and headbasket are suspended within a 6-inch diameter metal hoop by eight springs. The output transformer is located within the cylindrical shaft below the shockmount hoop.